This article was first published on Talk Magazine Shanghai 2014 August edition. 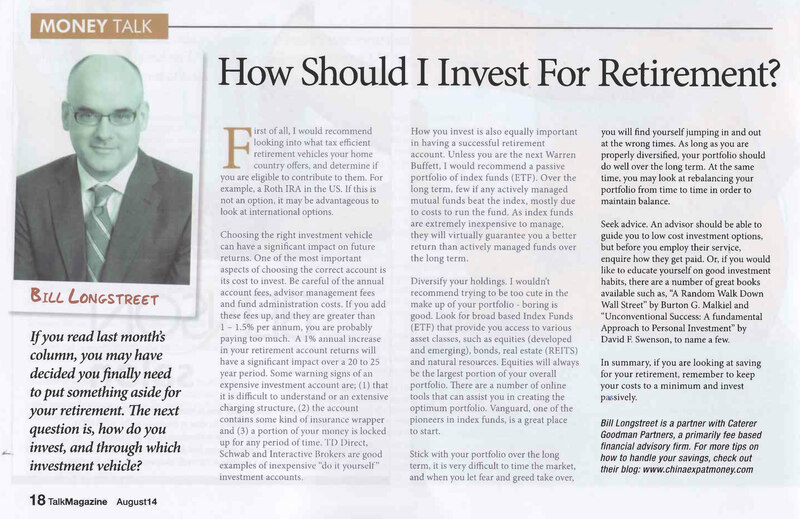 If you have read last month’s column, you may have decided you finally need to put something aside for your retirement. The next question is, how do you invest, and through which investment vehicle? First of all, I would recommend looking into what tax efficient retirement vehicles your home country offers, and determine if you are eligible to contribute to them. For example, a Roth IRA in the US. If this is not an option, it may be advantageous to look at international options. Choosing the right investment vehicle can have a significant impact on future returns. One of the most important aspects of choosing the correct account is its cost to invest. 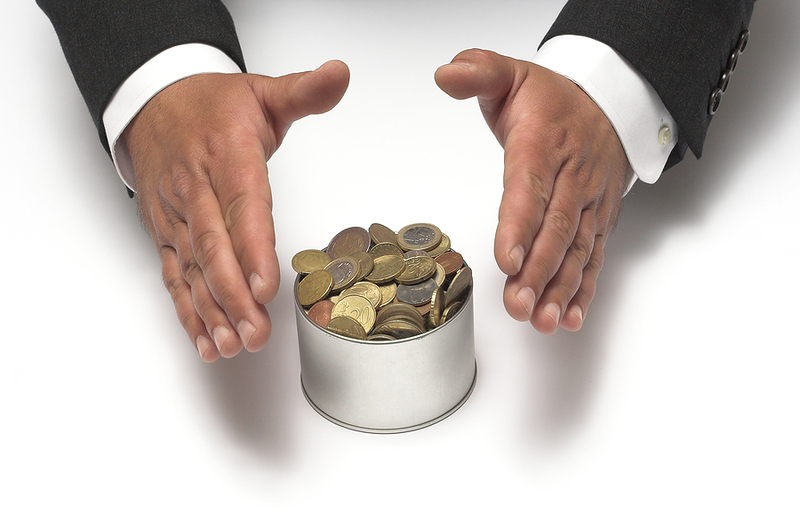 Be careful of the annual account fees, advisor management fees and fund administration costs. If you add these fees up and they are greater than 1-1.5% per annum you are probably paying too much. A 1% annual increase in your retirement account returns will have a significant impact over a 20-25 year period. Some warning signs of an expensive investment account are; (1) that it is difficult to understand or an extensive charging structure, (2) the account contains some kind of insurance wrapper and (3) a portion of your money is locked up for any period of time. TD Direct, Schwab and Interactive Brokers are good examples of inexpensive “do it yourself” investment accounts. How you invest is also equally important in having a successful retirement account. Unless you are the next Warren Buffett, I would recommend a passive portfolio of index funds (ETF). Over the long term, few if any actively managed mutual funds beat the index, mostly due to costs to run the fund. As index funds are extremely inexpensive to manage, they will virtually guarantee you a better return than actively managed fund over the long term. Diversify your holdings, I wouldn’t recommend trying to be too cute in the make up of your portfolio, boring is good. Look for broad based Index Funds (ETF) that provide you access to various assets classes, such as equities (developed and emerging), bonds, real estate (REITS) and natural resources. Equities will always be the largest portion of your overall portfolio. There are a number of online tools that can assist you in creating the optimum portfolio. Vanguard, one of the pioneers in index funds, is a great place to start. Stick with your Portfolio over the long term, it is very difficult to time the market and when you let fear and greed take over, you will find yourself jumping in and out of the markets at the wrong times. As long as you are properly diversified, your portfolio should do well over the long term. At the same time, you may look at rebalancing your portfolio from time to time in order to maintain balance. Seek advice. An advisor should be able to guide you to low cost investment options but before you employ their service, enquire how they get paid. Or, if you would like to educate yourself on good investment habits there are a number of great books available such as “A random Walk down Wall Street” by Burton G. Malkiel and “Unconventional Success A fundamental Approach to Personal Investment” by David F. Swenson, to name a few. In summary, if you are looking at saving for your retirement, remember to keep your costs to a minimum and invest passively.